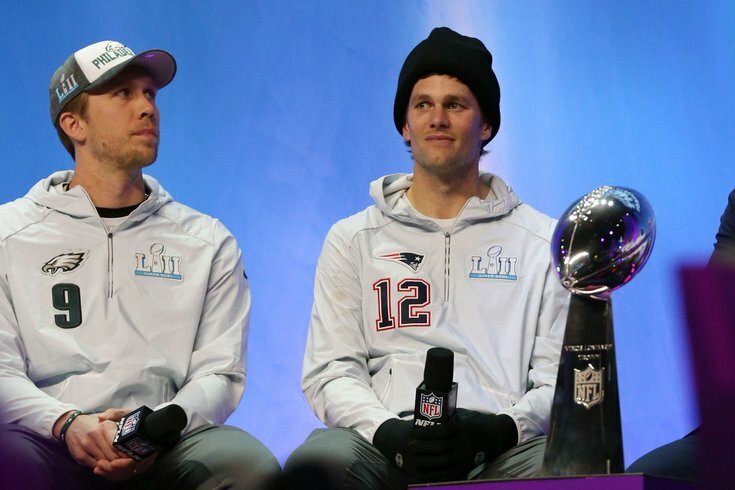 During the early portion of Super Bowl LII Opening Night, when the New England Patriots were the ones answer questions from the hundreds of reports inside the Xcel Center, quarterback Tom Brady had nothing but positives things to say about his counterpart in Sunday night's game, Nick Foles. While there may have been more fireworks – and more dog masks – when the Philadelphia Eagles took the floor shortly after, once you sorted through the typical media day madness, it was clear that the Eagles have great respect for the Patriots, especially their five-time Super Bowl champion quarterback. And if the Birds want to upset the Patriots and claim the city's first Super Bowl title, they'll need to stop Brady. That's easier said than done. "It has to start with our defensive line," said head coach Doug Pederson. "You have to get pressure on him. If you let him sit back there, he will pick you apart. He’s a Hall of Fame quarterback. He’s got great vision, gets the ball out of his hand extremely quick so our defensive line has to get that quick pressure on him." Fletcher Cox, one of the cogs of the Eagles' incredibly disruptive defensive front, knows how important pressuring Brady will be – and how crucial of a role he'll play in generating that pressure. But a fast start will only get them so far. They'll also need to finish. “We watched a lot of tape on him. We want him to move out of that spot. If we don’t get him off that spot, it’s gonna be a long day. It comes down to the two [defensive] tackles getting a push up the middle and get him off that spot. Most importantly, according to Foles, the Eagles need to be themselves. Julie's championship came in 2015, but her husband is still looking for his first, something he's hoping to change come Sunday. With the Eagles once again playing the underdog role, and having won each of their last two from that now-familiar position, there was no shortage of dog masks at Opening Night. But Brandon Graham won the night. "It’s been our story all year," said fellow defensive lineman Fletcher Cox. "Week 1, the Eagles [are] good, I don’t believe it; they're winning on luck. But we’ve proven we can be the better team every week – week in and week out. We just keep doing the routine things right. We don’t beat ourselves. We go out, we play for one another. Everyone does their job and that’s what we’ve been doing all year." Usually, when you hear about a story involving the Super Bowl and a bad tattoo, it has to do with something inked prematurely (and regrettably). But when it comes to defensive end Chris Long, the tattoo won't come until after his Eagles win the Super Bowl – not that it makes it any better.